Football/Soccer Session (Academy Sessions): 30/11/12 - Development Squad Warm Up. Agility Focus. A) 2 lap jog (4 mins). B) Box. 2 touch, (2 mins), 1 touch (2 mins). C) Hurdles. 2 left shoulder and 2 right shoulder lead unders and overs. Normal walkovers, two left leg lead, two right leg lead (3 mins). D) Mobility - 20m jog, return doing mobility exercises - arm swings, leg swings, kareokes, opening/closing gate, walking lunges, skips, heel flicks. Individual work and partner mobility work (4 mins). 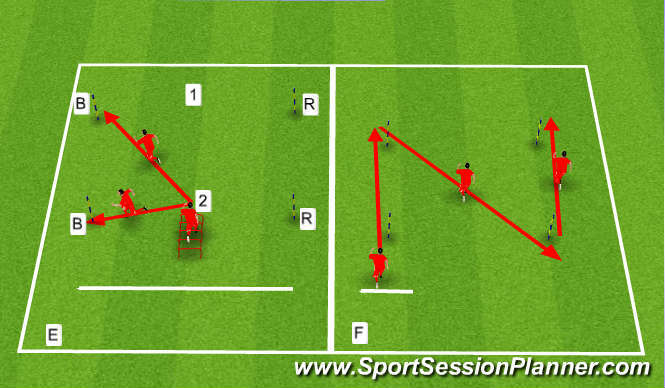 E) Burst 5m to hurdles then cut to level 1 to command blue ot red. Then level 2, blue or red again (2 mins). F) Forward to second pole, diagonally backwards (still facing forwards) to opposite diagonal pole, burst forward. Repeat twice on each side (2 mins).